We cordially invite you to celebrate the culmination of our dream — the Grand Opening of the Wiseburn High School campus, home of Da Vinci Communications, Da Vinci Design, and Da Vinci Science. This seven-year, $160 million project in El Segundo provides the Wiseburn community and beyond with an innovative 21st century learning facility that is the crowning achievement of one of the most successful School District/Charter School partnership collaboratives in the country. Da Vinci Schools and Wiseburn Unified School District are transforming a building once used to design fighter aircraft into an innovative campus for 21st century teaching and learning. The 210,000 square foot, four-story main building at 201 N. Douglas Street in El Segundo, CA, will serve up to 1,600 students in three high schools, incorporating the latest technology and hands-on, interdisciplinary environments for collaborative, project-based learning. 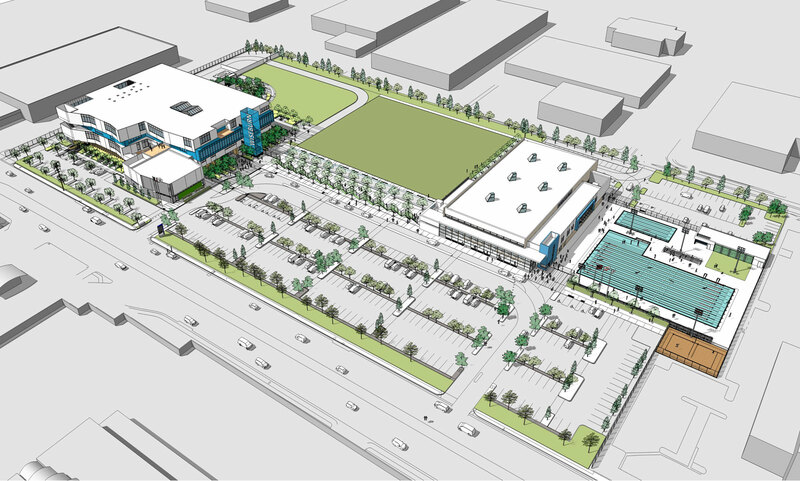 The campus also will serve as a community and recreational hub with an aquatic center, athletic field, theater, and multipurpose room for school and community use. The 13.7 acre campus will house Da Vinci’s three independent charter high schools — Da Vinci Communications, Da Vinci Design, and Da Vinci Science — that serve as Wiseburn Unified’s “home” high schools. Each floor of the new facility is designated to a specific school with its own principal and faculty. Da Vinci Science will be housed on the 2nd floor, Da Vinci Communications on the 3rd floor, and Da Vinci Design on the 4th floor. The first floor will house administrative offices for Da Vinci and Wiseburn, a theater/auditorium, music and recording studios, a multipurpose room, board room, and Da Vinci Institute, a professional development center providing adult learning opportunities for educational practitioners around the globe who are interested in studying the Da Vinci model. Designed by Gensler, a global architecture and design firm known for delivering innovative and flexible learning spaces, the main building features neighborhoods of teaching spaces—“pods”—that open out to large common areas for each school and an atrium that interconnects all three. The campus also will include an athletic field, gymnasium, and a 53 meter, Olympic-sized pool. Students from all three Da Vinci high schools compete in CIF sports as one team known as the Wiseburn-Da Vinci Wolves. In a joint-use agreement with the City of El Segundo, the Department of Parks and Recreation will maintain the pool and run the aquatics programs, which will be available to both Wiseburn and El Segundo residents. Community members, educational leaders, teachers and architects participated in a facility planning process led by David Stephen of New Vista Designs for 21st Century Learning, a key collaborator in the project. The first day of classes at the new campus will be November 8th. Phase 2 (the athletic field, gymnasium and pool) is expected to be completed by Summer 2018. For more information about the opening timeline, visit https://www.davincischools.org/new-campus-grand-opening/.